Now, everyone here knows that I am a huge fan of Tiger Tales books. I think they are generally adorable and cute. The new seasons of releases showed up on my doorstep and the box included some new Christmas titles. Tiger Tales have kindly agreed to give away a copy of each of the following to one of you so stay tuned for the giveaway at the end. Just a note: I'm going to cut this giveaway a little short so that we can wrap it up before the week of Christmas. 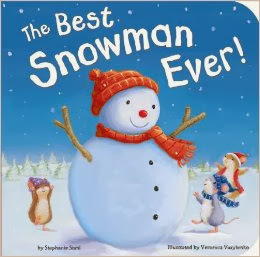 The first adorable title is The Best Snowman Ever! , by Stephanie Stahl. This title is a padded board book and it has sparkles on it. (My favorite!) Little Molly Mouse sets out to make the biggest snowman in the world but she's having something of a hard time doing it alone. It's hard to shove a huge snowball up a hill all by one's self. So she collects some friends to help her get it to the top where, much to their chagrin, it takes off rolling down the other side. However, the friends band together to tend to their now enormous snowball and do indeed manage to build the biggest glittery, sparkly one ever! Although this is a padded board book, each page spread has an average of six sentences on it which makes for a decent story. I'd earmark this one for ages 18 months on up (if you are considering the story). Of course, any age is a good age to enjoy the glitter. 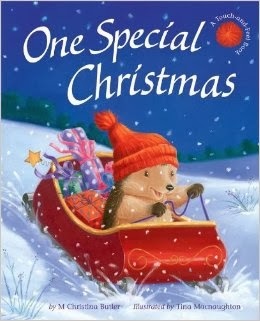 One Special Christmas , by M. Christina Butler might look a tad bit familiar to a few of you. This title is the newest in a series of books featuring Little Hedgehog. In this story, Little Hedgehog is busy cooking in his kitchen when he hears a big thump just outside his window. Santa has left a package for him and has asked for his help in delivering presents to the other animals in the forest. Little Hedgehog is happy to oblige but it wouldn't be a good story unless there was a struggle and Little Hedgehog has his fair share of it. In the end, with the help of his friends, all of the gifts are delivered and it is a happy Christmas indeed. Both of these titles are being enjoyed by my kids this Christmas season. If you are looking for some additional titles to add to your home collection, you might wish to consider these. What better way to add them than to win them though? It doesn't get much better than that! Would you care to win a copy of each of the above titles? Simply leave a comment below. This contest is open to U.S. Residents only and will be open through Thursday, December 19th. Enter soon and spread the word! Many thanks to Tiger Tales for sending copies of the following titles in order to facilitate this review. I have received no additional compensation for this review and all opinions are my own! I saw your post on Facebook! Such sweet illustrations. We love Christmas books! Ooh yes! I'd love these for my niece and nephew. I would love to win these books for my grandson! Thank you for the giveaway! Happy Holidays! We are always looking for more, well written children's books for our kids. Would love to win. These books are so cute. I have a little one who would love them. Thanks for having this giveaway. Look like fun reads with my 2 yr old! Thanks!! Why not? I need to fluff up our Christmas basket with more tales for the little boys!